JANUARY PRIZE: WHAT WOULD YOU PUT IN THIS BACKPACK? - What About Watermelon? You are here: Home / Prizes / JANUARY PRIZE: WHAT WOULD YOU PUT IN THIS BACKPACK? Happy New Year, everyone! As I sit here in disbelief that it’s actually 2016, I’m slowly regaining consciousness from the week-long food coma I slipped into after Christmas. Four Christmas dinners and three holiday parties — just the memory of it is making me hungry for those sweet and spicy meatballs my Aunt Judith made. Overall, Christmas in the Watermelon household was a success. On Christmas morning, my daughter rushed into our room at 6:30 a.m. to announce that it was, in fact, Christmas Day and Santa had come down our chimney with a mountain of presents. One of her favorite gifts from Santa was a new backpack decorated in true princess fashion, complete with blue bows and glittery straps. 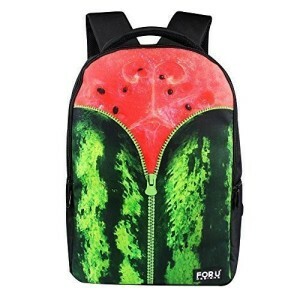 This watermelon backpack ($45 on Amazon) may not be as cool as my five-year-old’s, but it’s still an amazing prize or gift for the watermelon lover in your life. Leave a comment with what you’d carry in this pack, and I’ll choose one comment at random as the winner!